We develop an algebraic theory of threads, synchronous cooperation of threads and interaction of threads with Maurer machines, and investigate program parallelization using the resulting theory. 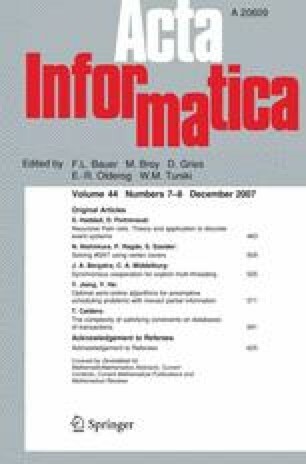 Program parallelization underlies techniques for speeding up instruction processing on a computer that make use of the abilities of the computer to process instructions simultaneously in cases where the state changes involved do no influence each other. One of our findings is that a strong induction principle is needed when proving theorems about sufficient conditions for the correctness of program parallelizations. The induction principle introduced has brought us to construct a projective limit model for the theory developed. The work presented in this paper has been partly carried out while C.A. Middelburg was also at Eindhoven University of Technology, Department of Mathematics and Computer Science. The work presented in this paper has been carried out as part of the GLANCE-project MICROGRIDS, which is funded by the Netherlands Organisation for Scientific Research (NWO).